It was roughly two hours into the Battle of Trafalgar on 21st October, 1805, about 1.15pm, that Great Britain’s most famous seaman, Admiral Horatio Lord Nelson, was fatally struck by a musket ball. Fired by a marksmen in the rigging of the French ship Redoubtable, the musket ball struck him in the left shoulder as he stood on the deck of his flagship, HMS Victory. Having fallen to his knees, he was spotted by the Victory‘s captain, Thomas Hardy, before he collapsed. Carried below the decks to the ship’s cockpit, it was there that he died (the Victory can still be visited at Portsmouth). His damaged coat, meanwhile, was placed under the head of Midshipman George Augustus Westphal, who was being treated for his injuries nearby. Blood from the midshipman (late himself an admiral) stuck his hair to one of the epaulettes, part of which was was cut away and retained by his family as a memento. The “undress jacket” was later returned to Nelson’s mistress, Emma Lady Hamilton, in accordance with his wishes. She later gave it to Joshua Jonathan Smith, Lord Mayor of London in 1810-1811, to as payment of a debt just prior to retiring to France in 1814. It was Prince Albert, the consort of Queen Victoria, who later purchased the coat for £150 from Smith’s widow and presented it to Greenwich Hospital in 1845. The jacket can now be found in the National Maritime Museum in Greenwich (housed in a section of the former Naval College). Along with the fatal musket ball hole on the left shoulder, the tails and left sleeve of the jacket are stained with the blood of John Scott, Nelson’s secretary, who had died in the early moments of the battle on the spot where Nelson was later shot. It’s also possible to see where the epaulette was damaged during the treatment of Midshipman Westphal. The front of the coat also features embroidered versions of the four orders of chivalry awarded to Nelson – these are the star of the Order of the Bath, the Order of the Crescent awarded by the Sultan of Turkey, the Order of St Ferdinand and of Merit awarded by Ferdinand IV of Naples, and the German Order of St Joachim. According to the National Maritime Museum, “Nelson habitually wore them on all his uniform coats”. The coat’s right sleeve is positioned as Nelson would have worn it – in 1797 he had lost his right arm at the Battle of Santa Cruz de Tenerife. 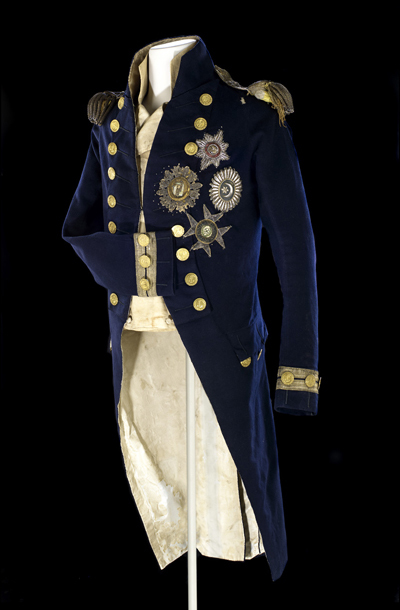 PICTURE: Vice-admiral’s undress coat worn by Nelson (1758-1805) at the Battle of Trafalgar. There is a bullet hole on the left shoulder, close to the epaulette. (c) National Maritime Museum, Greenwich, London, Greenwich Hospital Collection. WHERE: National Maritime Museum, Romney Road, Greenwich, (nearest DLR station is Cutty Sark or Greenwich mainline station); WHEN: Open 10am to 5pm daily; COST: Free; WEBSITE: www.nmm.ac.uk.